Okay, here goes! We are giving away super limited Square Enix Chrono Trigger shirts. There are apparently only like a handful of them in the entire world! We are going to give away five of these this week, one a day from Monday to Friday. We won't be doing a contest, but a race. Here's how it's going to go down: Each day we will do a post on the t-shirt, and the first person to send us an email will win the shirt. That's it! This is the commencing race (and the only one on Monday) so the first email we get at kotakucontestATgmailDOTcom will win this shirt. 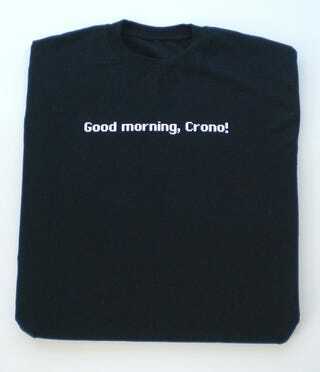 Be sure to put the subject line "Chrono Trigger DS Shirt Contest" and don't forget the quotes. You'll need to add the quotes in the subject line to win. Good luck! Eds Note: This contest is over for today. And we already have a winner. You'll have to wait until tomorrow for the next Chrono Trigger shirt race. STOP SENDING EMAILS.